The mountain whitefish, Prosopium williamsoni, is a member of the salmon and trout family native to the western United States and western Canada. The species prefers cold mountain lakes and streams with highly oxygenated water, and is common in such habitat in many areas of Utah. Although the mountain whitefish is not the most popular sport fish in Utah, many anglers seek this species, especially in the winter. Mountain whitefish, a native Utah fish species, are related to trout. They are present in many of Utah rivers and streams. They are excellent table fare, and are fun to catch while flyfishing. Mountain Whitefish are light brown on the back and fins and silvery to white on the belly and sides. Snout and lower jaw are short and blunt, with a flap on each nostril. Mountain whitefish eat insect larvae, insects, fish eggs, and small fish. Interestingly, mountain whitefish feed most actively during the winter and at night. The species spawns from late fall to early winter, usually in stream riffles with gravel substrate. No nests are made, but eggs are adhesive, and stick to the bottom. Eggs hatch in the early spring; no care is given to eggs or young. 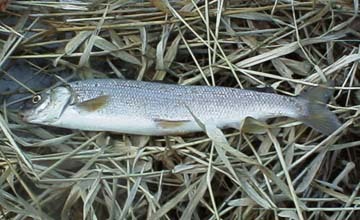 Mountain Whitefish are one of Utah's native fish species. There range is smaller than it was in historical times, however they can still be found in many Utah waters, mostly in rivers such as the Logan, Weber and Provo.